Rock and roll, plus some scientific inquiry and a splash of civic action, are at the center of ZEBRAFISH, written by Sharon Emerson. The story revolves around a girl, Vita, who wants to put together a band and put on a concert to raise money for a worthy cause. Eventually, she pinpoints Leukemia as the cause worth rocking for because one of her friends has secretly been battling it, and Vita enlists some new friends to join her. The goal? Raise enough money from a concert to purchase a machine for the hospital that will help speed along cancer research. The book comes close to being a bit too sappy at times, but what saves it is the earnestness of Vita, the caring role of her older brother (a scientist studying Zebrafish in order to find a cure for cancer), and the hodgepodge of friends. A nice dose of humor helps, too (including the audition session that comes across as a sort of Spinal Tap-inspired scene). Gaming, virtual bands and other hip topics make their way into the story, too, giving it a fresh, modern feel. The art by illustrator Renee Kurilla is colorful, vibrant and, in particular, the use of purple in Vita’s hair and other elements of the story bring a nice constant color palette to the artwork. One thing I did like is that the story does nicely mix in science (the use of the odd Zebrafish as a symbol of the band and a cure for sickness, the tricky subject of battling cancer in a laboratory, etc.) with the power of creating music for change, and the use of social action by passionate students on a mission. There’s also the backstory of Vita and her brother, a doctoral student who is raising Vita after their mother died. I could see a few topics here worth pursuing in writing and research. 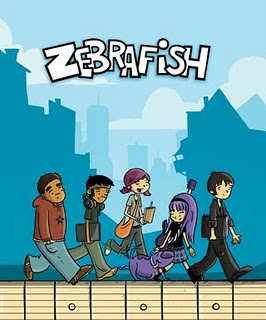 If you have students who are itching to do some community service project, ZEBRAFISH might be a nice companion story about how even young people can change the world for the better. I recommend ZEBRAFISH for an elementary classroom, and maybe a middle school reader could find interest in the story. I want to note, too, that the book is a collaborative team project by Fablevision, which is a company that creates interesting online, animated books and stories. I loved the endnote by Peter Reynolds, founder of Fablevision, where he encourages readers to pick a “challenge” and take action to change the world for the better, just like Vita and her friends have done. Also, proceeds from the sale of ZEBRAFISH benefit the Children’s Hospital in Boston, which is yet another reason to consider adding this one to your classroom library. Last week I was in Miami, FL presenting at the Miami Book Fair International –– School of Comics and Graphic Novels. Inspiring and teaching and all that jazz is a lot of fun. I get to share my passion and expertise. I like it. What can I say? When I got back, my family and I were hanging out with some friends who also happen to be parents at my school. The dad asked me –– for the second time, mind you –– about teaching programming in my class. He spent some time talking about how programming is exciting and engaging and inspires critical thinking. I've heard this before from him, and I agree with him. The problem is, I don't have any practical experience in programming. I know a lot about technology, but not code. So I am uncomfortable. I have to learn something new and then teach it. It's hard. I'm busy. I expect to do it magnificently or not at all. Within 24 hours of my presentation to a crowd of teachers who pay to learn more from me, I find myself on the receiving end of the professional development. I am the one being challenged and prodded. He is persistent and passionate and I feed on that energy. Why am I not teaching some programming? I run a technology lab. I should be teaching this. I have no excuse except my own shortcomings in that aspect. That's no excuse for any teacher who demands excellence from his students. I have high expectations of them and they and their parents should have high expectations of me. I went home that night and immediately used Facebook, sending out a distress call to everyone I know asking for ideas on how to teach programming to elementary students. Perhaps I should be embarrassed that I, a technology lab instructor, do not know programming. I am not. I have no problems admitting where I need to grow and learn as a teacher. If I allow my own inadequacies to keep me closed to new experiences, then I am limiting my students and keeping them down. No great sin occurs in the classroom. Besides, I don't mind admitting I'm don't know everything. I think education would make more strides toward innovation if more educators could openly admit their need to grow and seek out new opportunities. So far, I've had several responses from my Facebook friends who've offered great ideas and resources to help me. All I need to now is read what they've sent, install some free software on 29 computers, and get started. I hope people listening to my presentations feel my passion and energy the same way I felt it from my friend and parent from my school. If we continue to inspire one another, we will make life-changing strides in the field of education. It just takes overflowing love from those experts to fill those of us who are unsure and uneasy. And reasources. It takes lots of easy resources and specific implementation ideas to make a classroom a place kids want to learn. Our building is always full of student teachers from the Missouri State University. The Academy program is a rigorous, non-traditional student teaching program where students spend 12 weeks in their home classroom and four weeks completing four individual week-long rotations with different grades or specialities: upper grade, kindergarten, special education, technology, etc. My classroom is one of the standard rotations for Academy student teachers (S-T) in the district. The S-Ts get exposure to grades K-4 every day, along with technology, eMINTS, inquiry-based learning, singing, and comics. I teach on Monday and they teach the rest of the week. Yes, my S-Ts sing to grades K-1 and even during other times. My job is to make the learning environment fun, push the S-Ts, allow them to experiment without fear of endangering standardize testing learning, and expand their levels of comfort. This week, my S-T asked a lot of questions about reading and comics. She observed many of the fourth grade students in her home classroom didn't want to read anything but comics. Her concern was that they would never read anything beyond comics. The research on reading demonstrates that students who have choice in reading will read more. When given the choice to read comics students will develop a love of reading and move on to other modes (Norton (2003). My personal observations of comics fanboys reinforces the research. When they find out the role I play in comics and education, many of the fanboys expound on how comics taught them to read. More often than not, these fanboys are also avid readers of novels. Veto (2006) concluded that choice in reading creatives an environment where students are motivated and empowered to take responsibility for their own education. Many researchers (Cavazos-Kottke, 2005; Edmunds & Bauserman, 2006; Guthrie, Hoa, Wigfield, Tonks & Perencevich, 2006; McPherson 2007; Pachtman & Wilson, 2006; Veto, 2006) have demonstrated that choice in reading significantly determines reading motivation. The research that impacts me is by Edmunds and Bauserman (2006). They discovered that 84% of the children researched discussed books they had selected themselves. Only 16% discussed books that were assigned by the teachers. When forced to read what teachers want rather than what the students choose, reading motivation –– love of reading –– is significantly decreased. When do students discuss books they are reading? When they choose them. Will your students move on to other modes? The research states they will. We teachers must be patient and allow our students to develop a natural and progression toward reading. I have said often and I will continue to say: Teachers armed with high intentions and a desire to help kids often educate the love of reading out of students. It is driven by a need to see them read novels. We push them away from picture books before they are ready. This is especially true, in my opinion, with our boys. Teachers see images as crutches or barriers to reading when, in fact, the scholarly research on comics demonstrates the opposite. Not only do comics help students learn to read, but comics help them comprehend the skills we want to teach them. Most importantly, comics motive students to read. Not reading –– my friends –– never, ever leads to reading. Reading leads to read. For more information on how you can use comics in your classroom to teach inference, visualization, foreshadowing, sequence, descriptive language, universal themes and other literary skills, see our list of recommended textbooks for teaching comics. Come to one of my lectures. I am speaking at the Miami Book Fair International this week. I will be at the Wildcat Comicon in Pennsylvania in the Spring. Cavazos-Kottke, S. (2005). Tuned out but turned on: Boys' (dis)engaged reading in and out of school [Electronic version]. Journal of Adolescent & Adult Literacy, 49(3), 180-184. Edmunds, K. M., & Bauserman, K. L. (2006). What teachers can learn about reading motivation through conversations with children [Electronic version]. The Reading Teacher, 59(5), 414-424. Guthrie, J. T., Hoa, L. W., Wigfield, A., Tonks, S. M., & Perencevich, K. (2006). From spark to fire: Can situational reading interest lead to long-term reading motivation? [Electronic version]. Reading Research and Instruction, 45(2), 91-117. Little, D. (2005). In a single bound: A short primer on comics for educators. Retrieved January 19, 2008, from http://www.newhorizons.org/strategies/literacy/little.htmMcPherson, K. (2007, April). Millard, E., & Marsh, J. (2001). Sending Minnie the Minx home: comics and reading choices. Cambridge Journal of Education, 31(1), 25-38. Norton, B. (2003). The motivating power of comic books: Insights from Archie comic readers. The Reading Teacher, 57(2), 140-147. Pachtman, A. B., & Wilson, K. A. (2006). What do the kids think? [Electronic version]. The Reading Teacher, 59(7), 680-684. Schwarz, G. (2006). Expanding literacies through graphic novels. English Journal, 95(6), 58-64. Versaci, R. (2001). How comic books can change the way our students see literature: One teacher's perspective. The English Journal, 91(2), 61-67. Veto, D. (2006, April). Motivating reluctant adolescent readers. School Administrator, 4. Retrieved June 17, 2008, from WilsonWeb. Last week, I talked about teaching literacy as a back-end approach. That is to say, teaching the reading skills you want students to understand from the perspective of the creator and not the reader. If a student struggles with context clues, metaphor or figurative language as a reader, then perhaps teaching them as an author/illustrator will help them learn those skills in another way and then be able to transfer that knowledge when they are the reader. This week in the Hall of Heroes comic book club students were encouraged to work on their comics. Some chose paper and pencil while others used MakeBeliefsComix.com. There were those who worked independently and those who collaborated. Some used color while others did not. It should be noted that some students chose to read comics instead of make them. Above all things, the Hall of Heroes comic book club is about choice, which leads to a love of literacy and story. The required steps toward pandemic preparedness are eerily similar between an antibiotic-resistant strain of e-coli or an impending zombie-virus apocalypse. If one is going to write a how-to manual … might as well use zombies as the backdrop. The Centers for Disease Control's Office of Public Health Preparedness and Response did just that. While they were at it, the agency employed a technique long understood and used by the military: comics. The CDC created a zombie apocalypse comic, PREPAREDNESS 101: ZOMBIE APOCALYPSE, to teach the public how to prepare for real pandemic emergencies. Readers follow Todd, Julie, and their dog Max as a strange new disease begins spreading, turning ordinary people into zombies. Stick around to the end for a surprising twist that will drive home the importance of being prepared for any emergency. Included in the novel is a Preparedness Checklist so that readers can get their family, workplace, or school ready before disaster strikes. Click on the images below to view the novella. Transcripts of each chapter are provided below each chapter thumbnail.